The dental implant service of Lane Oral Surgery. When you refer patients to Lane Oral Surgery, know this first. We know implants – and what a difference they can make in the lives of your patients. Such a laser focus has enabled us to develop an approach that combines best technology, materials and practices into a positive patient experience. What makes SmileOn! different is simple: With SmileOn!, you do more than learn about the implant procedure. You become an integral part of it. 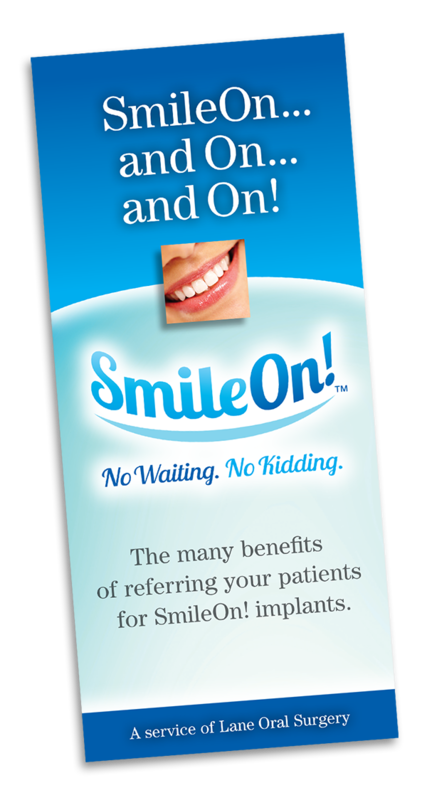 To learn more about the benefits that accrue to you and your practice when you participate in the SmileOn! network, please call 877-SmileOn (764-5366), send us an email or fill out the form below and we will send you a password to access our secure portal – exclusively for restorative dentists. View our participating Dentists/Laboratories HERE. CLICK HERE to view or download the SmileOn! informational brochure.